Affordable housing is a hot topic in New York City these days, especially as housing costs increase to the point of pricing out lower- and middle-income residents from Manhattan and parts of the other boroughs. All too often affordable housing this century is part of larger, market-rate developments rather than standalone projects. Yet 25 years ago concerns over affordable housing focused on infill housing, as a means of knitting the city’s punctured blocks together and creating housing where it was most needed. 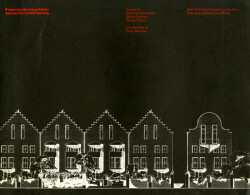 The book followed a competition, exhibition and symposium on infill housing in Harlem, but instead of competition entries the book has essays (one by NYC housing historian Richard Plunz, one reason I bought the book), notes on the symposium and a catalog of selected, contemporary infill housing projects from Europe and the United States.